Shear stress investigations on an oil-water emulsion system result in drop breakup over the experimental time. To count drop sizes in pumping processes, the suitability of inline endoscopy was successfully demonstrated in this protocol. Dittler, I., Dornfeld, W., Schöb, R., Cocke, J., Rojahn, J., Kraume, M., Eibl, D. A Cost-effective and Reliable Method to Predict Mechanical Stress in Single-use and Standard Pumps. J. Vis. Exp. (102), e53052, doi:10.3791/53052 (2015). Pumps are mainly used when transferring sterile culture broths in biopharmaceutical and biotechnological production processes. However, during the pumping process shear forces occur which can lead to qualitative and/or quantitative product loss. To calculate the mechanical stress with limited experimental expense, an oil-water emulsion system was used, whose suitability was demonstrated for drop size detections in bioreactors1. 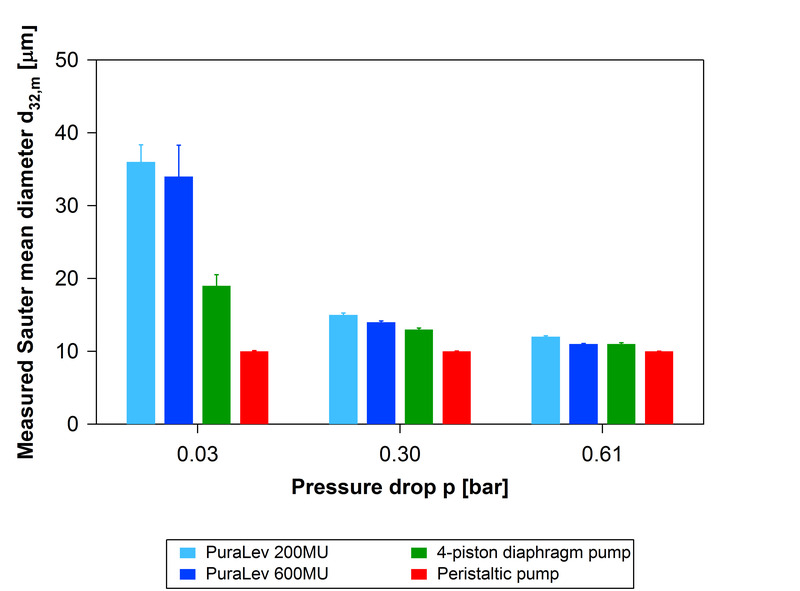 As drop breakup of the oil-water emulsion system is a function of mechanical stress, drop sizes need to be counted over the experimental time of shear stress investigations. In previous studies, the inline endoscopy has been shown to be an accurate and reliable measurement technique for drop size detections in liquid/liquid dispersions. The aim of this protocol is to show the suitability of the inline endoscopy technique for drop size measurements in pumping processes. In order to express the drop size, the Sauter mean diameter d32 was used as the representative diameter of drops in the oil-water emulsion. The results showed low variation in the Sauter mean diameters, which were quantified by standard deviations of below 15%, indicating the reliability of the measurement technique. Pumps are used to transfer cell cultures in the pharmaceutical and biotechnological industries. During the pumping process, mechanical stress can result in irreversible cell damage, which might impair the quantity and quality of the product1-4. The level of mechanical stress depends on the pump type and pump settings, as demonstrated in previous studies5-6. Commonly, peristaltic, syringe and diaphragm pumps are used for single-use (SU) technology based applications. These pumps result in high local shear forces caused by the compression of the pump tubing and the pulsating flow7. In order to overcome these drawbacks, magnetically levitated centrifugal pumps (MagLev centrifugal pumps) constitute a promising alternative. The motor is magnetically driven in order to avoid narrow gaps between the impeller and the pump housing (Figure 1). A previous study investigated the MagLev centrifugal pumps and showed lower mechanical stress in Chinese Hamster Ovary (CHO) cells compared with peristaltic and 4-piston diaphragm pumps5. In addition, hemolysis analyses revealed no significant blood trauma and thrombus formation over a range of operation conditions using these pumps8-11. The findings demonstrate that use of these specifically designed pumps applies less mechanical stress on biological systems in comparison with peristaltic and diaphragm pumps. To investigate the mechanical stress with limited experimental expense, an oil-water emulsion model system is recommended due to its cost- (ca. 99.8%) and time-reduced (ca. 99.5%) application compared with biological cell culture systems. As drop breakup of the oil-water emulsion system is a function of mechanical stress, drop sizes must be counted over the experimental time of shear stress investigations. Many techniques for sizing drops are available, which can be divided into sound, laser and photo based techniques12. In particular, the use of the photo-optical probe inline endoscopy shows almost identical drop sizes for manual and automatic detections (standard deviation below 10%) and enables a detection of 250 drops per minute13. Because of its accuracy and reliability, the endoscope technique has been shown to be an effective standard measurement technique for drop size distributions in liquid/liquid dispersions when compared with other commonly used probes (e.g., fiber optical forward-backward-ratio (FBR) sensor, focused beam reflectance method (FBRM) and the two-dimensional optical reflectance measurement technique (2D-ORM))12,14. Moreover, the suitability of inline endoscopy for measuring drop sizes in a stirred vessel has been demonstrated several times in previous investigations15-18. Based on a prior study6, this protocol describes the use of inline endoscopy to determine drop sizes (Sauter mean diameter) of an oil-water emulsion system in pumps. The Sauter mean diameter was used as a comparison criterion in order to estimate the mechanical stress of the multi-use (MU) MagLev centrifugal pumps, a peristaltic and a single-use (SU) 4-piston diaphragm pump. Figure 1. Magnetically levitated centrifugal pump-system. (A) The principle of a bearingless motor and (B) the PuraLev 200MU are shown as an example. Please click here to view a larger version of this figure. The investigations were performed using a piped pump setup (Figure 2), which enables mechanical stress experiments at flow rates up to 60 L min-1 and pressure drops up to 2 bar to be performed. As shown in Figure 2, the experimental setup is comprised of the storage vessel, the pump circuit, and the equipment for the inline endoscopy technique. The impeller of the storage vessel was only used to mix the surfactant. Peripheral elements were integrated into the closed loop to monitor the flow rate V̇ and pressure drop p at different pump settings. The investigations were varied by using the hand-wheel valve. Ensure that the bioreactor (D = 0.15 m, H/D = 2.2) is equipped with an impeller for the dissolution of the surfactant and make sure that the inlet tube dips into the fluid to avoid a gas entering. Equip the pump loop with a syringe port, the investigated pump, a clamp-on flow meter, a single-use pressure sensor and a hand-wheel valve. After connection of the pump loop to the storage vessel, connect the pump head to the motor and prepare the endoscope probe. Mount the changeable reflection plane, a rhodium mirror in this case, at the probe tip and adjust the distance between mirror and lens to 150 µm. Adjust the screw at 100 µm to focus the sharpness of the objective. Connect the probe to the stroboscope via a fiber-optic cable and the camera of the endoscope to the computer via an Ethernet cable. Then, connect the camera and the stroboscope together via a trigger-box cable. Start the computer and open the manufacturer-provided software, which includes an image acquisition and recognition software, as well as result analyzer software. Select the image acquisition software in the main menu. Click on the button “Detect device” in the upper left corner of the screen to detect the camera. Under “Directory Settings” select the location on the computer for saving images and activate the command “Create trigger sub folders”. Enter the process parameters in section “Trigger mode: Ready”. After completion of all preparatory work, pour 5 L deionized water into the storage vessel and switch on the pump to fill the pump and the pump loop. Switch off the pump and add 0.9 ml of surfactant (csurfactant = 0.18 ml L-1, ρsurfactant,20°C = 1,070 kg m-3, critical micelle concentration (cmc): ωcmc ≈ 0.018 ml L-1, ωsurfactant ≈ 10 · ωcmc) with a 10 ml pipette under stirring. After 10 min the surfactant is completely dissolved. Switch off the impeller and turn on the pump. Position the endoscope probe so that the lens is located directly beneath the inlet tube. Set the flow rate of 3.4 L min-1 and the pressure drop of 0.03, 0.3 or 0.61 bar by varying the impeller speed and the hand-wheel valve. Weigh 6.3 g of oil directly in the syringe (βoil = 1.26 g L-1, ρoil,20°C = 989.5 kg m-3). Start the image acquisition software and add the oil via the syringe port. The running pump distributes the emulsion drops. After 1 hr, finish the shear stress investigation and clean the inline endoscope as well as the bioreactor with the integrated pump loop. Subsequently, prepare the experimental setup for the next pumping process. Open the automatic image recognition software in the main menu. Under “Batch Root Directory” select the location on the computer for saving the files (all*.csv). Select the column “Image Series Path” and click on the button “Add Image Series Subfolders” in the lower left corner of the screen to load the image series. Load the process parameters which are provided by the manufacturer. Select the column “Search Settings (*.pss or auftrag_*.mat)” and click on the button “Set Search Settings” in the lower-middle of the screen to load process parameters in order to specify the drop recognition. Select the column “Search Pattern (*.psp or F_*.mat) and click on the button “Set Search Pattern” in the lower right corner of the screen to load the process parameters in order to specify the drop analysis. Start the image recognition by clicking on the button “Start Batch”. After completion of image recognition, express the detected drop sizes by the Sauter mean diameter (d32), or any other representative mean value or distribution of choice by using the result analyzer software. Open the result analyzer software in the main menu. Activate the command “all*.csv in 1 Folder” and click on the button “Load Folder(s)” in the upper left corner of the screen to load the previously saved all*.csv file. Select the relevant value (e.g., Sauter mean diameter) in the drop-down list in the upper middle of the screen to visualize the results. For the calculation of the diameter enter the scaling of 0.6591 µm pixel-1 on the right, which is provided by the manufacturer. Figure 2. Experimental setup. Pump circuit for piped pump setup using inline endoscopy as the measurement technique: (1) storage vessel, (2) syringe port, (3) pump, (4) pressure sensor, (5) flow sensor, (6) stroboscope, (7) computer with the manufacturer-provided software, and (8) endoscope probe. Please click here to view a larger version of this figure. Figure 3 shows the particle recognition images after a pumping time of 1 hr. The upper four images show the drops before recognition and the lower four images show the drops marked by the recognition software. The drops detected are highlighted with a green edge. Comparing the upper and lower images shows that the drop edges were precisely detected by the image recognition software. The images on the left show the drop distribution for the MagLev centrifugal pumps PuraLev 200MU and PuraLev 600MU, and those on the right show the 4-piston diaphragm and the peristaltic pump. An optical assessment allowed an initial classification of the mechanical stress in the model emulsion system. This revealed that larger drop sizes and lower drop counts were generated by the MagLev centrifugal pumps compared with the 4-piston diaphragm and peristaltic pump. Consequently, the MagLev centrifugal pumps, especially the PuraLev 200MU, showed reduced drop breakage, indicating lower mechanical stresses. Figure 3. Images of the inline endoscopy. Emulsion drops before (A, B, C, D) and after (E, F, G, H) particle recognition after 1 hr of pumping using (A, E) the PuraLev 200MU, (B, F) the PuraLev 600MU, (C, G) the 4-piston diaphragm pump, and (D, H) the peristaltic pump under identical operating conditions (3.4 L min-1 and 0.03 bar). Please click here to view a larger version of this figure. Further investigations revealed standard deviations below d32 ± 0.4 µm and guaranteed reproducible results when using inline endoscopy19. Therefore, multiple investigations were not required for this approach, which additionally reduced the experimental expense. In order to express the drop size, the Sauter mean diameter d32 (see Eq. 1) was used as the representative diameter of drops in the oil-water emulsion for this approach. In general, the Sauter mean diameter decreased over time for all pump types and pump settings until reaching steady state12. Investigations in this study confirmed the progression of the Sauter mean diameter (Figure 4A to D), curves of the PuraLev 200MU (Figure 4A) and the peristaltic pump (Figure 4D) being exemplarily discussed in this protocol. In contrast to the PuraLev 200MU, the Sauter mean diameters were up to 40% smaller for the peristaltic pump at the same operation conditions (flow rate = 3.4 L min-1; pressure drop = 0.03 bar). As a consequence, higher mechanical stresses resulted in an increased drop breakup and therefore smaller drop sizes. 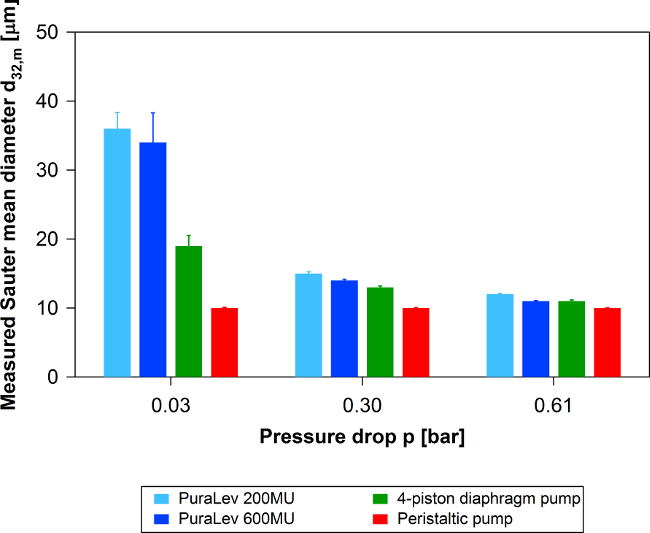 Furthermore, the Sauter mean diameter decreased with increasing pressure drop in the PuraLev 200MU (Figure 4A), which indicated the dependency of drop size on pressure drop. In contrast, the peristaltic pump showed a Sauter mean diameter of d32,60min = 10 µm at the end of the experiment for all process parameters (Figure 4D). Therefore, the Sauter mean diameter was found to be independent of pressure drop. However, the results reflect physical understanding of the drop breakup: with higher mechanical stress, smaller Sauter mean diameters were determined (see also Figure 5). For each measurement point, at least 300 drops were determined in order to guarantee statistical certainty. The maximal standard deviation decreased for the PuraLev 200MU from d32,4min ± 42 µm and for the PuraLev 600MU from d32,6min ± 21 µm to approximately d32 ± 0.5 µm at the end of the pumping process. The decreased standard deviation resulted from the increased homogeneous drop size distribution until steady state was reached. In comparison to the MagLev centrifugal pumps, the peristaltic and 4-piston diaphragm pumps revealed standard deviations below d32 ± 10 µm. Figure 4. Typical profiles of Sauter mean diameters d32 over time and the determination of the measured Sauter mean diameters d32,m. Comparison of Sauter mean diameters d32 (A) for the PuraLev 200MU, (B) for the PuraLev 600MU, (C) for the 4-piston diaphragm pump, and (D) for the peristaltic pump. The Sauter mean diameters d32 were determined at a flow rate of 3.4 L min-1 and pressure drops ranging from 0.03 to 0.61 bar. The measured Sauter mean diameter d32,m was calculated for the last 10 min (boundary). The resulting standard deviation of the Sauter mean diameters d32 (N ≥ 300) is shown. Please click here to view a larger version of this figure. As described above, the Sauter mean diameter decreased over time until the drop sizes reached steady state. In the last 10 min of the experimental time, the average value of the Sauter mean diameter was calculated to determine the measured Sauter mean diameter, which was used as a comparison criterion (see boundary of Figure 4A-D). The measured Sauter mean diameters d32,m are shown for a flow rate of 3.4 L min-1 and a pressure drop range from 0.03 to 0.61 bar in Figure 5. Larger measured Sauter mean diameters were determined for both MagLev centrifugal pumps (200MU and 600MU) and the 4-piston diaphragm pump at lower pressure drops and impeller speeds. The peristaltic pump revealed measured Sauter mean diameters of d32,m = 10 µm for all process parameters. As previously mentioned, shear forces were independent of the pressure drop for the peristaltic pump. The largest measured Sauter mean diameters of d32,m = 36 µm for the PuraLev 200MU and d32,m = 34 µm for the PuraLev 600MU were obtained at a pressure drop of 0.03 bar. In comparison with their counterparts, the MagLev centrifugal pump series obtained up to 59% larger measured Sauter mean diameters. These results indicated a lower rate of drop breakup and thus lower mechanical stress resulting from the use of the centrifugal pumps. The standard deviation of the measured Sauter mean diameters during the steady state was below 15%, thereby confirming reliable and accurate values for the drop sizes. Figure 5. Comparison of measured Sauter mean diameters d32,m. Measured Sauter mean diameters for the MagLev centrifugal pumps and their counterparts at 3.4 L min-1 and pressure drops of 0.03, 0.30 and 0.61 bar. The resulting standard deviations of the measured Sauter mean diameters d32,m during the steady state are shown. Abbreviations Please click here to view a larger version of this figure. Table 1. Table of abbreviations and nomenclature. The aim of this protocol is to show the suitability of the inline endoscopy technique for drop size measurements in pumping processes. For this purpose, drop sizes of an oil-water emulsion system were determined and a measured Sauter mean diameter was calculated to characterize the mechanical stress of the MagLev centrifugal pumps as well as their counterparts, a peristaltic and a 4-piston diaphragm pump. The results showed low variation of the measured Sauter mean diameters, which were quantified by standard deviations of below 15%, indicating that drop sizes have been reliably and accurately measured. As a consequence, the measured Sauter mean diameter could successfully be used as a comparison criterion to evaluate the mechanical stress of the pumps investigated. The MagLev centrifugal pumps revealed larger measured Sauter mean diameters, indicating lower mechanical stresses on emulsion drops compared with the peristaltic and 4-piston diaphragm pumps. In studies to date, inline endoscopy has been shown to be a robust and simple technique for reliable drop size measurement1,6,12-14,20-21, which was also confirmed by this study. In comparison to alternative measurement techniques, such as the fiber optical FBR sensor, the FBRM and the 2D-ORM technique, the endoscope technique can be used as the standard method for obtaining precise data in liquid/liquid applications12,14. The easy handling of the inline endoscopy and the simple production of the non-biological oil-water emulsion system enables a straightforward procedure for drop size detections according to the protocol text (see above). Nevertheless, it should be mentioned that the position of the endoscope probe depends on the fluid flow in the storage vessel. Further investigations (data not shown) have revealed that the lens of the probe should be located directly beneath the inlet tube for lower flow rates up to 5 L min-1 in order to avoid a multiple detection of one drop19. For sharp images at flow rates over 5 L min-1, it is recommended to position the probe at least 10 cm away from the inlet tube. Independent of process parameters, the holder of the inline endoscopy should be stable in order to avoid a shifting of the probe, which can result in blurred images. Furthermore, it should particularly be noted that the drop size detected is close to the lower detection limit of the applied photo-optical system, where the minimum detectable drop diameter is 6.5 µm. As the manufacturer-provided software has been improved, inline endoscopy techniques can reliably detect a minimal drop size of 1 µm. Moreover, the image processing will be further developed to enable online monitoring of industrial applications. While the present study focused on relatively low flow rates of up to 3.4 L min-1, future studies should consider a wider range of operation conditions. First investigations have been carried out at flow rates up to 20 L min-1 (data not shown). However, a 1:2 dilution (csurfactant = 0.09 ml L-1, coil = 0.64 ml L-1) of the oil-water emulsion system is recommended at flow rates over 10 L min-1 19, as increased drop breakup caused by higher mechanical stress would otherwise affect drop detection and reduce the number of drops detected. Tests were carried out with a 1:2 dilution and compared with results of an undiluted oil-water emulsion system. For both approaches, the Sauter mean diameters have been reliably measured (standard deviation below 5%). Therefore, reduced volume fraction (1:2 dilution) did not influence the measured Sauter mean diameters, and thus a drop-drop breakup was negligible. These powerful experimental approaches provide a good basis for the improvement of the endoscopy technique as well as the related image acquisition, recognition and result analyzer software. Furthermore, the suitability of the endoscopy technique to classify pump types and series according to their mechanical stress was successfully demonstrated. The results obtained are essential for pump design development and the optimization of pumps to reduce cell damage. Wolfgang Dornfeld and Reto Schöb are employees of Levitronix, Ltd., manufacturer of the MagLev centrifugal pumps. The authors would like to thank the Commission for Technology and Innovation (CTI, Switzerland) for their financial support (No. 13236.1 PFFLI-LS). Select a tubing length of about 45 cm before the pump. Select a tubing length of about 45 cm after the pump and clamp on the flow sensor to this tubing. Prepare the emulsion directly before the experiment. Handle with gloves and goggles. Wollny, S. Experimentelle und numerische Untersuchungen zur Partikelbeanspruchung in gerührten (Bio ) Reaktoren (Experimental and numerical investigations of particle stress in stirred (bio-) reactor). Technische Universität Berlin. Berlin. (2010). 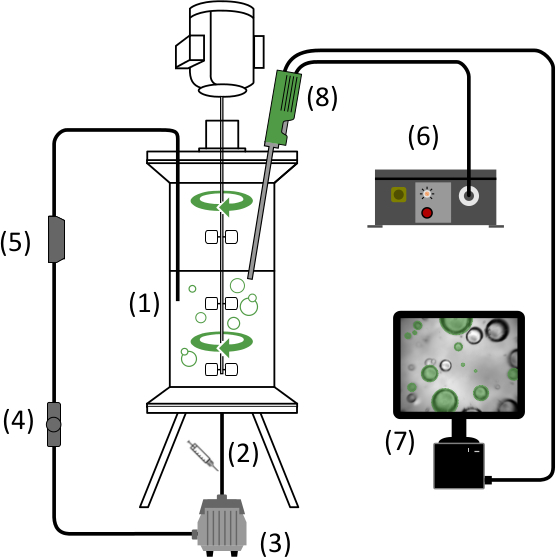 Jaouen, P., Vandanjon, L., Quéméneur, F. The shear stress of microalgal cell suspension (Tetraselmis suecica) in tangential flow filtration systems: the role of pumps. Bioresour. Technol. 68, (2), 149-154 (1999). Bee, J. S., et al. Response of a concentrated monoclonal antibody formulation to high shear. Biotechnol. Bioeng. 103, (1), 936-943 (2009). Klaus, S. Bluttraumatisierung bei der Passage zeitkonstanter und zeitvarianter Scherfelder (Blood trauma during passage through steady and transient shear fields). RWTH Aachen University. Aachen. (2004). Blaschczok, K., et al. Investigations on mechanical stress caused to CHO suspension cells by standard and single-use pumps. Chem. Ing. Tech. 85, (1-2), 144-152 (2012). Dittler, I., et al. A cost-effective and reliable method to predict mechanical stress in single-use and standard pumps. Eng. Life Sci. 14, (3), 311-317 (2014). Kaiser, S. C., Eibl, D. Single-use Pumpen in der Prozesstechnologie (Single-use pumps in the process technology). Chemie extra. 30-31 (2013). Aggarwal, A., et al. Use of a single-circuit CentriMag® for biventricular support in postpartum cardiomyopathy. Perfusion. 28, (2), 156-159 (2012). Kouretas, P. C., et al. Experience with the Levitronix CentriMag® in the pediatric population as a bridge to decision and recovery. Artif. Organs. 33, (11), 1002-1004 (2009). Khan, N. U., Al Aloul, M., Shah, R., Yonan, N. Early experience with the Levitronix CentriMag® device for extra corporeal membrane oxygenation following lung transplantation. Eur. J. of Cardio Thorac. 34, (6), 1262-1264 (2008). Zhang, J., et al. Computational and experimental evaluation of the fluid dynamics and hemocompatibility of the CentriMag blood pump. Artif. Organs. 30, (3), 168-177 (2006). Maaß, S., Grünig, J., Kraume, M. Measurement techniques for drop size distributions in stirred liquid-liquid systems. Chem. Process Eng. 30, (4), 635-651 (2009). Maaß, S., Rojahn, J., Hänsch, R., Kraume, M. Automated drop detection using image analysis for online particle size monitoring in multiphase systems. Comput. Chem. Eng. 45, 27-37 (2012). Maaß, S., Wollny, S., Voigt, A., Kraume, M. Experimental comparison of measurement techniques for drop size distributions in liquid/liquid dispersions. Exp. Fluids. 50, (2), 259-269 (2011). Henzler, H. J. Particle Stress in Bioreactors. Adv. Biochem. Eng./ Biotechnol. 67, 35-82 (2000). Sprow, F. B. Drop size distributions in strongly coalescing agitated liquid-liquid systems. AIChE J. 13, (5), 995-998 (1967). Shinnar, R. On the behaviour of liquid dispersions in mixing vessels. J. Fluid Mech. 10, (2), 259-275 (1961). 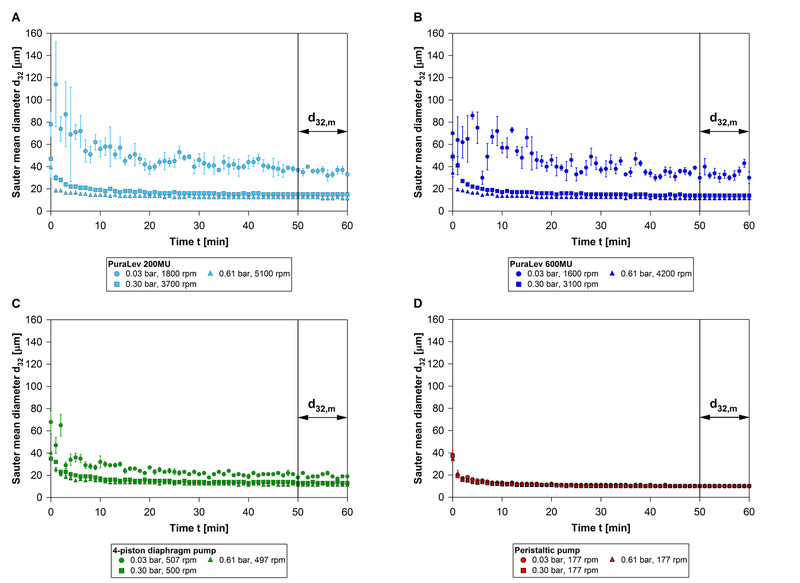 Ritter, J., Kraume, M. On-line measurement technique for drop size distributions in liquid/liquid systems at high dispersed phase fractions. Chem. Eng. Technol. 23, (7), 579-581 (2000). Fries, T. Quantifizierung der mechanischen Beanspruchung von Pumpen auf tierische Zellen mittels des nicht-biologischen Modellsystems Emulsion (Quantification of mechanical stress caused by pumps on mammalian cells using a non-biological emulsion model system). University of Applied Sciences Berlin. Berlin. (2014). Maaß, S., Wollny, S., Sperling, R., Kraume, M. Numerical and experimental analysis of particle strain and breakage in turbulent dispersions. Chem. Eng. Res. Des. 87, (4), 565-572 (2009). Maaß, S., Metz, F., Rehm, T., Kraume, M. Prediction of drop sizes for liquid/liquid systems in stirred slim reactors - Part I: Single stage impellers. Chem. Eng. 162, (2), 792-801 (2010).